When I was a car-crazy boy, I spent a large amount of my allowance on car magazines and books. My favorite book was the Encyclopedia of American Cars, an exhaustive look at virtually every automobile ever made on these shores. My copy was from the 1980s, but the publisher updated it periodically through the early 2000s. That same publisher issues six issues of Collectible Automobile magazine annually, and I’ve subscribed for nearly 20 years. I’m still car crazy! Then as now, I drool over photos of cars I can only dream of owning, and pore over their histories and manufacturing statistics. And so every May when I go to the Mecum Spring Classic, a large classic-car auction held at the Indiana State Fairgrounds in Indianapolis, I hope to see some of the most exotic, rare, and unusual cars that I have only ever seen in photographs. Each year, I mark a few more cars off my list. Here are the cars I got to see in person for the first time at this year’s auction. Stutz cars were made right here in Indianapolis, so you’d think I would have seen one by now. 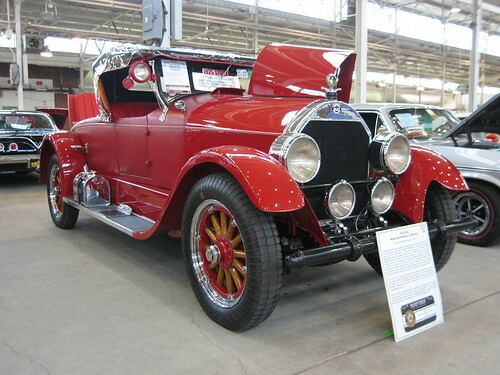 But this 1926 Stutz Model 695 was my first. 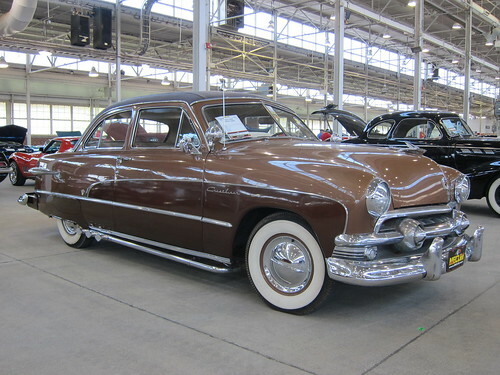 I’ve always really liked the 1949-1951 Fords. They’re pretty common and I’ve certainly seen plenty of them – but never a Crestliner coupe with its distinctive two-tone paint scheme. This Crestliner is from 1951. 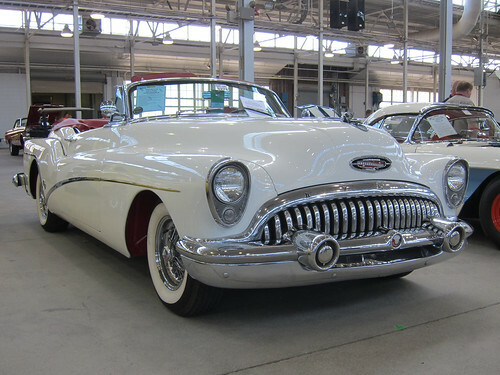 Buick introduced its Skylark in 1953 to commemorate the company’s 50th anniversary. During my 1970s kidhood, Skylarks were compact cars near the entry-level end of the Buick hierarchy. But the first Skylarks were premium automobiles that stickered north of $5,000, which is equivalent to about $43,000 today. 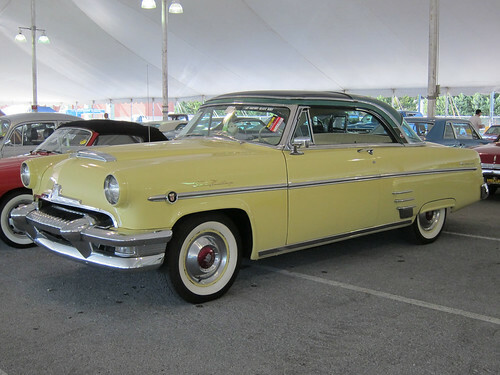 Ford flirted with see-through roofs in 1954, producing such a car in both the Ford and Mercury lines. Both cars shared the same green acrylic roof panel. This is the Mercury version, which was called the Sun Valley. 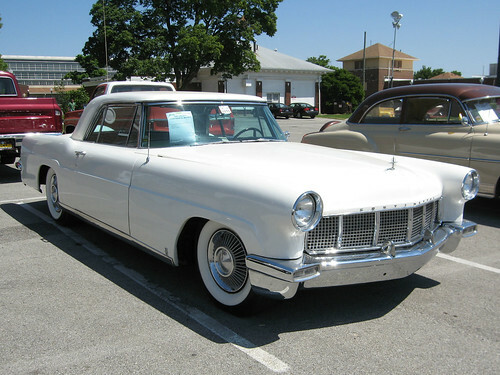 Ford produced the Continental Mark II in 1956 as its own make – in other words, it wasn’t a Lincoln Continental, it was just a Continental. And it was ex-pen-sive at more than $10,000 – that’s more than $84,000 today. Unbelievably, Ford took a loss on each one! They sold fewer than 3,000 Mark IIs before pulling the plug in 1957, so it’s no wonder I’d never encountered one before. 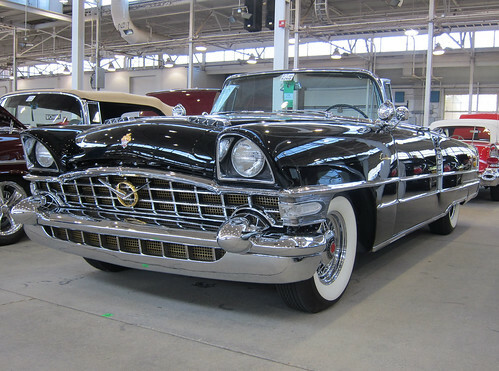 The 1956 Packard Carribean couldn’t breathe the Mark II’s air, but it was still a plenty exclusive and expensive car. Fewer than 1,000 Carribeans were built in each of the model’s four years. I didn’t know that the Carribean’s seat cushions could be flipped. One side was cloth and the other leather. 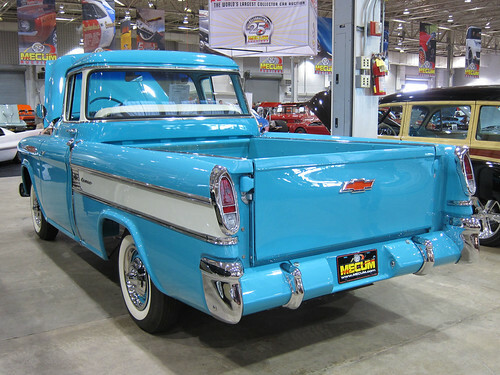 It may be hard to believe today, but all trucks came with “stepside” beds before 1955, when Chevrolet introduced its straight-sided Cameo Carrier. (This one’s from 1957.) Obviously, the look caught on. 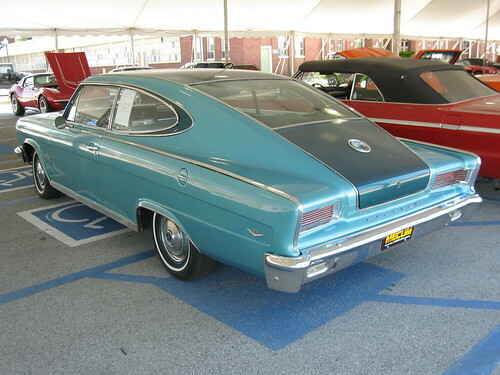 When American Motors introduced the Rambler Marlin in 1965, it was trying for a sporty midsize car, something for the guy who really wanted a Mustang but needed a usable rear seat. Few liked the styling, however. Presidential candidate Mitt Romney drove one when he was in high school – no doubt because his father was running American Motors at the time. Malcolm Bricklin may be best remembered for being the first to import Subarus into the United States, but he also produced a sports car of sorts in the 1970s. The Bricklin SV-1 had powered gullwing doors and a slew of safety equipment that made the car very heavy, and therefore quite slow. 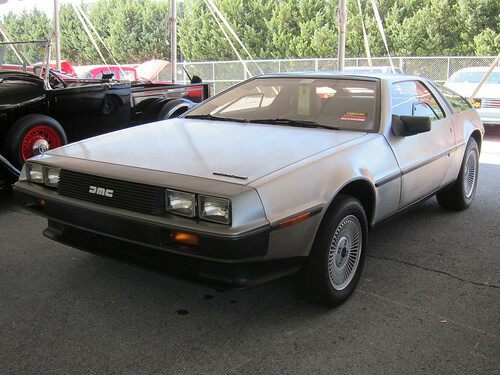 John DeLorean also used gullwing doors in his sports car, the DMC-12, but you had to push them open yourself. It’s funny – I’d always looked forward to encountering my first DeLorean, but I was simply underwhelmed by this one. I think its 1980s styling, so daring in its day, seems mighty tame today. Next time: My favorite photos from this year’s auction. This was my fourth year at the auction. See photos from the other years here, here, and here. Very nice presentation. With the exception of the Stutz, I’ve seen everyone of these marques on the streets and highways doing what cars were made to do. Either I’m an old geezer, or you are a whippersnapper, or both. Yeah, it’s a generational thing to be sure! Also, I really meant to tell you that a high school buddy of mine got a brand-new Crestliner in exactly that color in 1951. Drove the tires off it in less than 7000 miles. Sounds like he got a lemon. Tell me about it! There are hundreds of cars at this auction every year. Love the 1951 Ford coupe! I think they’re adorable! My 20yo loves the DeLorean! He is constantly scanning Craigslist and classifieds for one to buy. Love car shows/auctions like this! Gives you a chance to see some of the rarer and less popular cars. Like that Continental…how much is that car worth today? And to think Obama wants to do away with them! I’m with you on the ’51 Ford. Though I’d rather have a ’49 or ’50 for their bullet noses. I wish your son good luck with his DeLorean dreams. Glad I provided a little comic relief in your day! Great write-up of that show. The Mecum folks should hire you to produce catalogs. Wow, what a fun job that would be. I wonder if the cars of today will look as good to the people who are young today as these cars look to me? I like the idea of a two tone paint job. I don’t think they do that with new cars today. I follow a blog called Curbside Classic, which presents photos of “classic” cars still in service. It is remarkable how the crowd there, which is generally 10-ish years younger than me, goes all giddy over cars like the 1981 Malibu Classic. I would never have thought anyone would consider that car a classic, but it sure is to them. With the possible exception of the Rambler Marlin, those are all beautiful cars! But the Stutz is my favorite. They knew how to build cars. 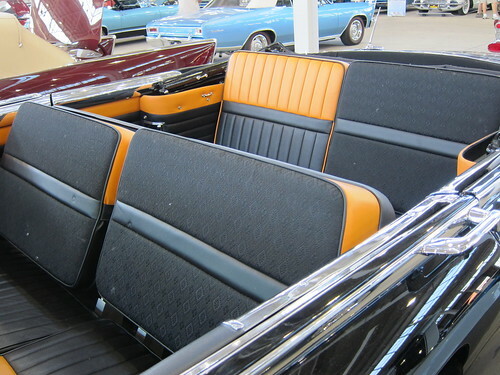 The Packard’s reversible seat cushions are a nice touch. * For the young among us, John Delorean was entrapped by federal agents, probably at the behest of the “Big Three” automobile manufacturers. He was arrested for drug trafficking but was acquitted. I really wanted to like the Marlin. I remember seeing it in photos as a kid and thinking it must be cool. But nope, it was dumpy and frumpy. My favorite of these was the Skylark. It oozed excess. Nice pictures of some rare cars. I’ve been looking a lot longer than you and believe I have encountered them all with the possible exception of the ’57 Cameo. I’ve seen Cameos but maybe not a ’57. I even owned a 1954 Mercury though not a Sun Valley. It served me well for about a year then gave its all in a demo derby. One of the advertising slogans for the Marlin was “The man sized fastback.” I’ve seen the Ohio DeLorean club at a few events and they are regulars in Cincinnati’s St Patrick’s Day parade. Among their 20+ cars is one outfitted with a fully functional — as near as I can tell — flux capacitor. And the car-crazy kids today will be writing blog posts in 20 years about their first sightings of the 1984 Mustang SVO and the Buick Reatta, or something like that. Ah, the circle of life. Nice presentation! 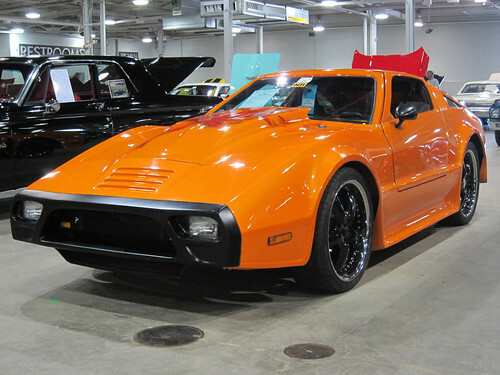 Hard to pick out my favorite, but the Mecum Spring Classic sure got my attention. Thanks. I go every year, and look forward to it very much.